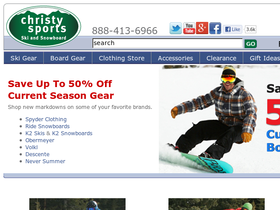 Shop for all your outdoor adventure gear and apparel at Christy Sports, online at store.ChristySports.com. Find all you need for your skiis or snowboard, including bindings, boots, accessories, gear, clothing, headwear & helmets, gloves, goggles & sunglasses, bags & packs, and more. Also, top brands such as Burton, RIDE, 686, Obermeyer, Dynastar, Rossignal, and Spyder can be found here. Check out RetailSteal.com for incredible Christy Sports codes, Christy Sports discounts, and Christy Sports coupons. Shipping at Christy Sports is free for orders over $50. Unused items may be returned within 50 days for a refund, but the shipping cost will not be refunded. Shop the clearance section at Christy Sports and enjoy up to 75% off a wide range of snowboarding and ski gear. Click link to shop. Enjoy free shipping on all orders over $50 at Christy Sports. Click link to shop. Get up to 60% off ski gear at Christy Sports. Click link to save on Tecnica, Lange, Rossignol, and others. Save up to 70% in the clearance sale at Christy Sports. Right now at Christy Sports, enjoy savings up to 45% on Spyder Clothing. Click link to shop. At Christy Sports, save up to 60% off during the online tent sale for a limited time. Click link for savings. Get an extra 10% savings on sale items from Skis.com when you use our code. Get an extra 20% discount on any one sale item from Skis.com when you use our code.